Welcome to the UK Yacht Delivery. Here you will find information about our delivery service and then ask for a quotation for the delivery of your boat. About us and our company . We have been delivering sail & power boats for over 40 years in all types of vessels from as far north as Finland to as far south as the Canary Islands & deep into the Mediterranean, Caribbean, Gulf of Mexico & Atlantic crossings. 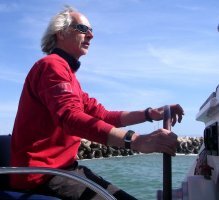 Myself & our Skippers are professional yachtsman with qualifications up to 24 metres & 200 gross tons for power & sail boats, we are also RYA sail & power boat instructors, this allows us to give professional tuition on route on assisted passages with the owner and/or his crew from RYA Competent Crew to Coastal Skipper level certification. Our crew come mostly from the Crouch Sailing School or have been recommended by other skippers. Your Requirements. You may want a skipper plus crew or perhaps just a skipper to assist you, whatever your requirements we hope to give you the confidence that your boat will be delivered with care, maybe a new or second hand boat to your home port, or your existing boat to a new location for a holiday or a new permanent location. Fees. We can give you a fixed delivery fee plus expenses or a daily rate delivery fee plus expenses. www.ukyachtdelivery.co.uk & let us quote for your safe delivery. Before you Buy. Pre purchase consultation is a service we offer to prospective purchasers, its just advice from our wealth of experience of so many types of boats that we have been involved with over the years, therefore we may be able to help before you go ahead and spend out on a survey or buy the first boat you see. Des Purcell at the helm. Contact him for a chat about your delivery and get n estimate of the costs involved for you particular requirements.